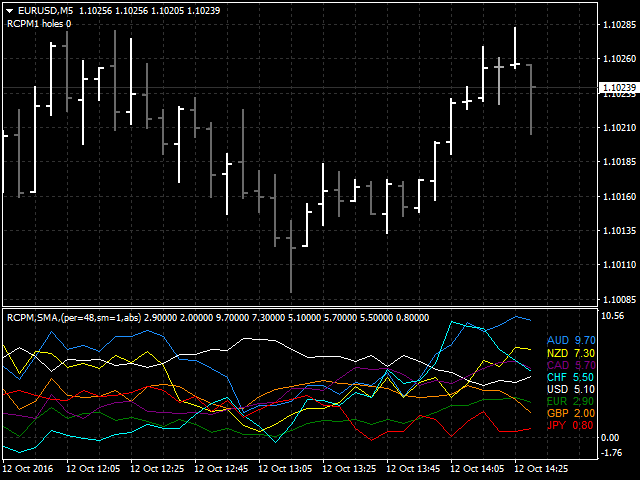 This is a linear indicator of a currency power (correlation) having the ability to filter by smoothing values. It shows the current power of 8 major currencies, as well as historical values without redrawing. It is based on a custom algorithm. 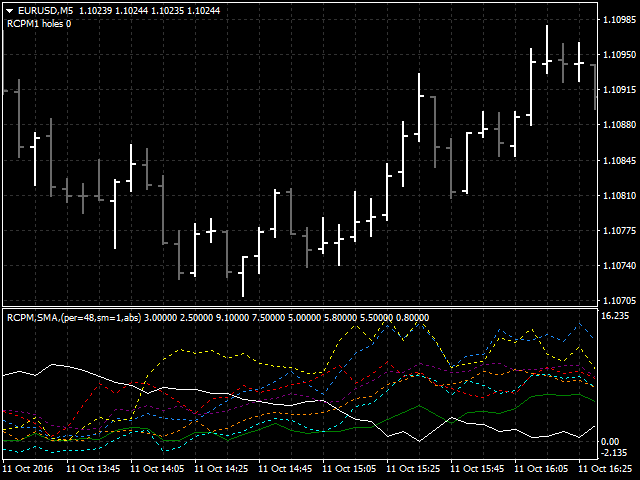 A basic currency pair is used for the calculation basis; the currency pair can differ from the current chart symbol. 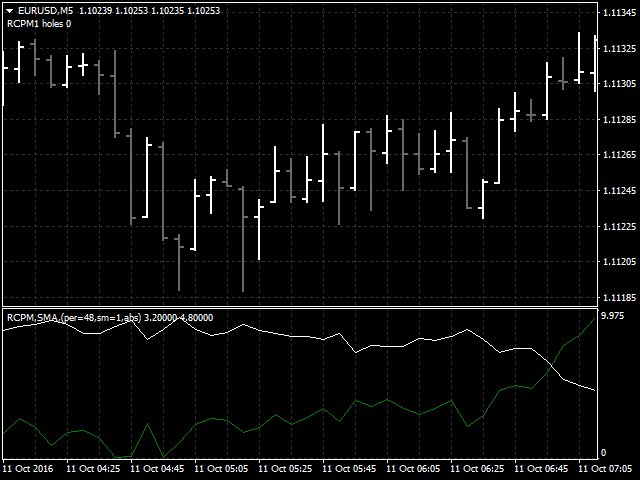 The result depends on the selected chart timeframe the indicator is launched at and on the basic currency pair. The indicator works with any extended names of standard currency pairs (you should specify the appropriate value in the parameters). iPeriod - number of bars used to analyze currency power. HistoryBars - number of calculated bars on history. The parameter affects execution time during the first launch. It is also necessary for reducing the necessary history data in case a broker has limitation on history length. SmoothingPeriod - data smoothing period (to enable smoothing, set to 1). SmoothingMethod - data smoothing method. ShowPairLabels - enable/disable display labels with names of currencies in the left part of the indicator window. LabelsFontSize - currency label font size. ShowCrossArrows - show/hide arrows marking the intersection of currency power lines for the current currency pair. UseAbsoluteValues - enable/disable the mode of using absolute (true) or "step" (false) values for calculating currency power. ArrowShift - shift to display arrow above or below the price. ArrowUpColor - the color of the up crossing arrow. ArrowDnColor - the color of the down crossing arrow. ArrowUpCode - the code of the up crossing arrow (Wingdings). ArrowDnCode - the code of the down crossing arrow (Wingdings). Strength Line EUR - show/hide the power line. Strength Line GBP - show/hide the power line. Strength Line AUD - show/hide the power line. Strength Line NZD - show/hide the power line. Strength Line USD - show/hide the power line. Strength Line CAD - show/hide the power line. Strength Line CHF - show/hide the power line. Strength Line JPY - show/hide the power line. UseBase - the basic currency for calculations. PairPreffix - an addition to the names of currency pairs. For example, if the name of the currency is "EURUSD.e" = ".e"
ShowWarningComments - enable/disable comments on the operation errors, for example, the absence of symbol quotes or insufficient symbol history length at a broker's side. ShowHolesCount - show/hide in comments information about missing quotes.